TransCanada Corp. (TSX, NYSE:TRP) and Phoenix Energy Holdings Ltd. have entered into a 50-50 partnership to build a $3-billion pipeline in Northern Alberta. The Grand Rapids project will carry crude oil and diluent for oil sands producers northwest of Fort McMurry, one of the centres of Canada’s oil sands industry, starting in early 2017. “As Alberta crude oil production continues to grow, it’s critical to have the infrastructure in place to move oil to market from emerging developments west of the Athabasca River,” said in a press release Russ Girling, TransCanada’s president and chief executive officer. “This is the first major pipeline project to meet the needs of this fast-growing area,” he added. Calgary-based TransCanada operates one of North America’s largest networks of energy pipelines, but its best-known development is the controversial Keystone XL project. Keystone XL, which would expand TransCanada’s capacity to carry Alberta crude to refineries in the U.S. Gulf Coast region, has been hindered by woes over the potential environmental consequences of building the pipeline. It has also been affected by worries about what it could occur in the event of a major spill. Supporters argue the ducts are key for providing the U.S. with a stable source of energy, and say technological advances have reduced the hazards. The final Grand Rapids Pipeline route and design will be determined with aboriginal and stakeholder input, said the company. It will also consider environmental groups feedback, archaeological and cultural values, land use compatibility, safety, constructability and economics. 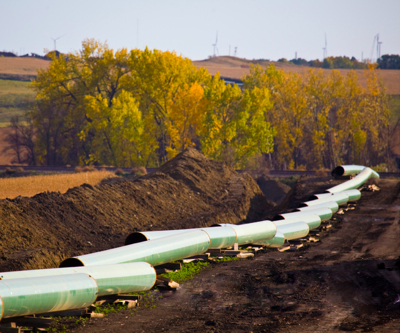 TransCanada said it expects to apply for regulatory approval for the project next year. Canada exports 2 million barrels of oil per day to the U.S. and almost all of it ends up at Cushing, Oklahoma, the pricing point for U.S. crude, which refining capacity is limited. Alberta production is set to more than double to 3.7 million barrels by 2025 out of a total of 4.7 million. Production in the U.S., particularly from the Bakken basin in North Dakota, will see the country ramp up current output of 7.8 million barrels to 10.9 million barrels over the next few years.